How to Hard Reset Lenovo S880 (LePhone) Easily? How to Hard Reset Lenovo S880 LePhone Phablet? 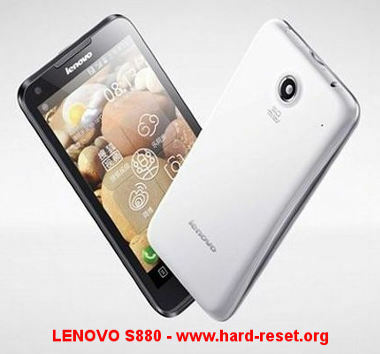 That the easy way to Hard Reset or Master Reset our Lenovo S880 to format it become factory default. [Q] i have formatted my lenovo s880 using computer, but when i tried turning the mobile on, it only shows the logo of android and under it shows formatting/data... and it freezes there. any help? [A] Hi, unfortunately we can not give good advice if your do hard reset or reformat your Lenovo S880 using custom rom or non standard tweak steps. Because there are some non standard possibilities that can happen. Please consult with the community that suggest you to reformat or flashing using computer, maybe they can help. Otherwise, you should bring your Lenovo S880 to Lenovo authorize service center. [A] Hi, please try to hard reset using hardware button combination key: Start your Lenovo A880 from off positions, then press POWER BUTTON until Lenovo logo appear, then continue press VOLUME UP + VOLUME DOWN together until menu appear, then choose device reset. The information from this page describe about hard reset lenovo s880,lenovo s880 hard reset,reset lenovo s880,lenovo a800 hard reset,lephone c05 hard reset,how to hard reset lenovo s880,factory reset lenovo s880,lenovo s880 hang,how to reset lenovo s880,cara reset lenovo s880. If you need another resource for hard reset, use search function at this homepage or find from our related posts. How to Easily Master Format ACER LIQUID Z330 with Safety Hard Reset? How to Easily Master Format SAMSUNG GALAXY ON NXT with Safety Hard Reset? my lenovo s880 it have a problem. the system in my lenovo s 880 death. n know my lenovo ia mal function. what can i do? Hi, what happen when you turn on the power of Lenovo S880? Is the LED/LCD back light at display turning on but blank at screen? If the LCD Back light also off, it should be hardware problem or battery problem. You can try bring to Lenovo service center for further check. i power off my s880 at nidht and it was half full battery. when power on morning,the pop up messages were still here. i power off again,remove battery and sim card. To my surprise, it wont turn on. i kept trying but in vain. Hi, it seems that your Lenovo S880 applications get trouble or crash with Google Play apps. We suggest you to do hard reset with follow the steps above with hardware button key. But you also can do master format with menu Setting > Backup & reset > Factory data reset, follow the menu to finish hard reset process. But please backup all important data before doing any hard reset steps, because all data will be removed or wipe after doing hard reset. Doing hard reset will reinstall fresh and factory default applications to your Lenovo S880, so basically without any other problem, the Google Play service will run again with fresh installation automatically. Hi, please try to hard reset using hardware button combination key: Start your Lenovo A880 from off positions, then press POWER BUTTON until Lenovo logo appear, then continue press VOLUME UP + VOLUME DOWN together until menu appear, then choose device reset. i have formatted my lenovo s880 using computer, but when i tried turning the mobile on, it only shows the logo of android and under it shows formatting/data… and it freezes there. any help? Hi, unfortunately we can not give good advice if your do hard reset or reformat your Lenovo S880 using custom rom or non standard tweak steps. Because there are some non standard possibilities that can happen. Please consult with the community that suggest you to reformat or flashing using computer, maybe they can help. Otherwise, you should bring your Lenovo S880 to Lenovo authorize service center.